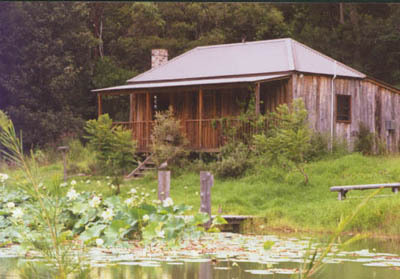 Jacaranda, named after the trees that have grown in front of the veranda, the cabin looks directly over the Lilly pond, set beside the pond is your private BBQ area and a rustic hardwood garden setting to sit and while away the day. On the front veranda is a long lounge to relax on and fall asleep in the morning sun. Or just stay inside in front of the open fire with wood aplenty, provided by your courteous staff. Surely this is Gods country, birds, fish, frogs, crystal clear water and magnificent sky’s, totally peaceful, maybe this is heaven.